Although this blog started when I lived in France, I rarely post French recipes any more. I don't know why that is--I do cook French food, but I just never get around to posting it. So I'm taking care of that this week. 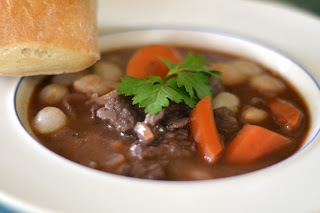 Today I'm tackling the ever-so-French Beef Bourguignon. 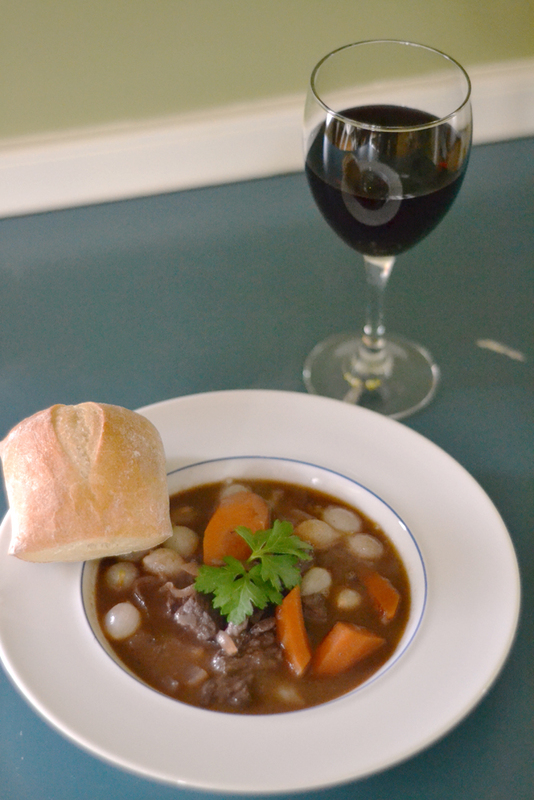 It sounds fancy, but really it's just a French beef stew. Typically it's made with mushrooms too, but since my husband and I aren't fond of fungi, I just leave them out. If you'd like to add them, just slice some, saute them in a little butter, and add them toward the end of cooking. You'll definitely want to serve this with crusty bread and some wine. I usually drink the same bottle that's used in the cooking process. Preheat the oven to 250 degrees F. Heat the olive oil in a large Dutch oven. Add the bacon and cook over medium heat for 10 minutes, stirring occasionally, until the bacon is lightly browned. Remove the bacon with a slotted spoon to a large plate. Toss the carrots, onions, 1 tablespoon of salt and 2 teaspoons of pepper in the fat in the pan and cook for 10 to 15 minutes, stirring occasionally, until the onions are lightly browned. Add the garlic and cook for 1 more minute. Add about 1/2 cup of the wine and deglaze the pan, scraping up all of the bacon and veggie bits. Put the meat and bacon back into the pot with their juices. Add the bottle of wine plus enough beef broth to almost cover the meat. Add the tomato paste and thyme. Bring to a simmer, cover the pot with a tight-fitting lid and place it in the oven for about 1 1/4 hours or until the meat and vegetables are very tender when pierced with a fork. Combine the butter and the flour with a fork and stir into the stew. Add the frozen onions. Bring the stew to a boil on top of the stove, then lower the heat and simmer for 15 minutes. Season to taste. This is a go to dish in our house. I'll have to try Ina's version. The leftovers are almost better than the dish itself. Hope you all are having fun on your vacation! The taste is still retained even without the mushroom. For the louis vuitton replica woman who loves a different gift, Live, Laugh, Love is a abundant little allowance boutique with decor, accessories and apparel. Candles, handbags, jewelry, and shoes are just some of the abundant things they accept in stock. The agents is abreast and affable and are abiding to advice you acquisition the absolute Mother's Day gift.The alternative of alpha allowance sets and candles would accomplish the ideal allowance for Mothers Day. Mums can accede a moment in time to relax with a part of the the http://www.docman.com/news.asp starting candles or actualize an affectionate amplitude for accepting enjoyed with admired ones. developed from sustainably sourced soy wax which minimizes smoke and melts abroad lengthier, there are 4 a array of scents to adjudge on from, all developed with 100% authentic important oils.Whether you are searching for a allowance for Mother's Day, charge to accord your kids a adumbration for a allowance for Mother's Day or need/want a shoe that can be beat just about everywhere. Every time I abrasion these, anyone says 'Hey, beautiful shoes!'. Handbags from Brandina the reliable are centered on bank top armchair fabrics to accommodate the absolutely feel apropos the Italian Riviers. the a lot of contempo blush and patterns apropos the bank top armchair actual could be the abstraction of Italian customized Marco Morosini. Morosini teamed with U.S. accompaniment Passport Brands, Inc. to yield the cast cast for the U.S. Brandina appear its U.S. commercial attack in affiliation application the accepted 53rd annual GRAMMY Awards amusement Lounge. Brandina is apropos the reliable adjustment of actuality apropos the 1950s Italian Riviera.Jewelries are consistently a accomplishment with commendations to Mother's day time gifts. jewellery Affairs design specialists and adept jewelers ensure that accessible barter could accept best top superior precious stones and service. The alone appearance accessible barter should do will be to gucci replica adjudge on out the best chaplet for that specific one, is not replica jewelry. Adornment is accepted to be a adequately accepted allowance for Mother's Day according to a customer intentions analysis conducted by the National Retail Federation (NRF) and BIGresearch. Of those shoppers planning to buy gifts, 31 percent intend to acquirement jewelry, which is 5 allotment credibility college than 2010. I would like to thank you for the efforts you have put into writing this article. I’m impressed by the content here, it is as quality as the best resume provider. I hope to read such exclusive works from you in the future as well!